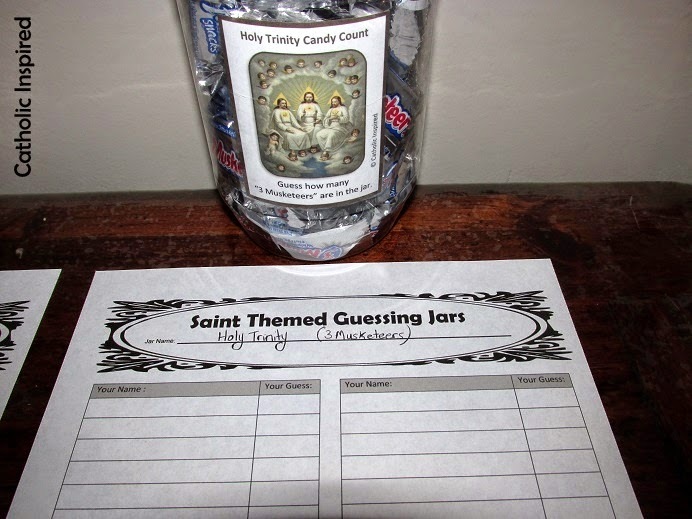 It took several days of brainstorming, but I finally came up with a new table game for our All Saints day party - Saint-themed guessing jars! 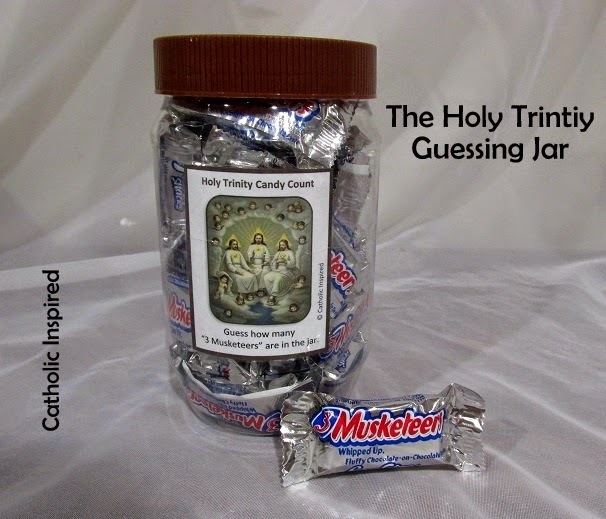 My first thought was to make a guessing jar that had "3 Musketeers" in it and call it a "Holy Trinity Guessing Jar". 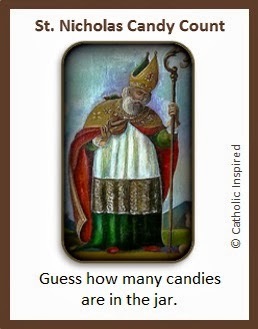 Then I (with my husband's help) tried to think of all kinds of candies and crackers that could be a symbol or have a meaning that centered around a saint. We came up with several - some are not included here, but maybe I can add them to a future post. 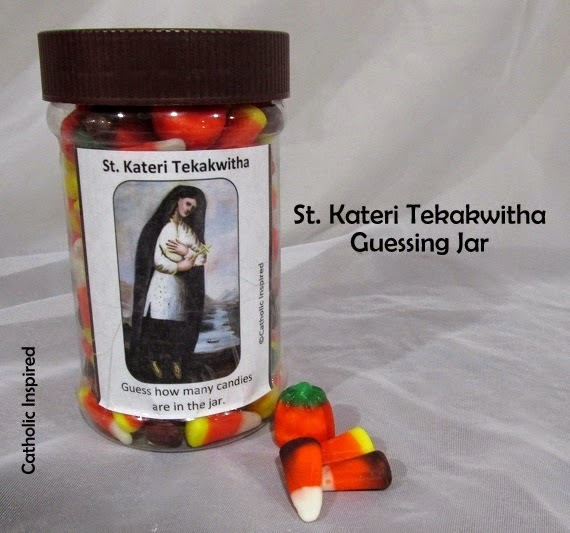 Basically, these jars are filled with candy or crackers that have a saint theme. 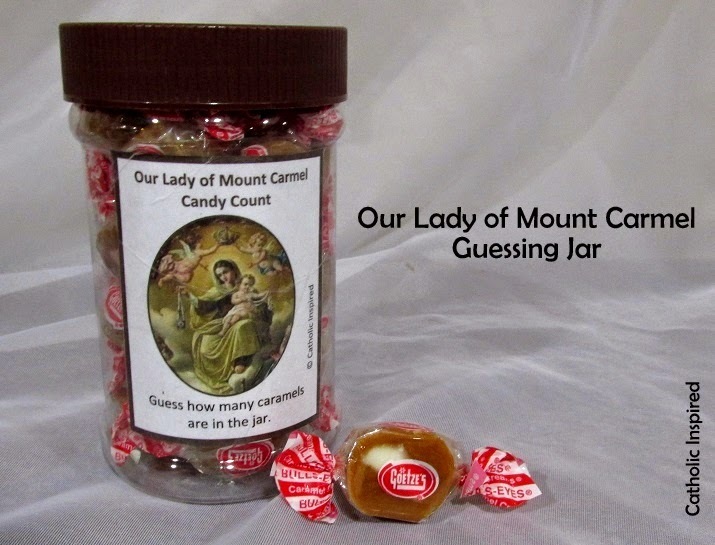 The kids (and adults) can guess how many candies or crackers are in the jar. The person with the closest guess wins the jar! It's simple, saint-inspired fun! 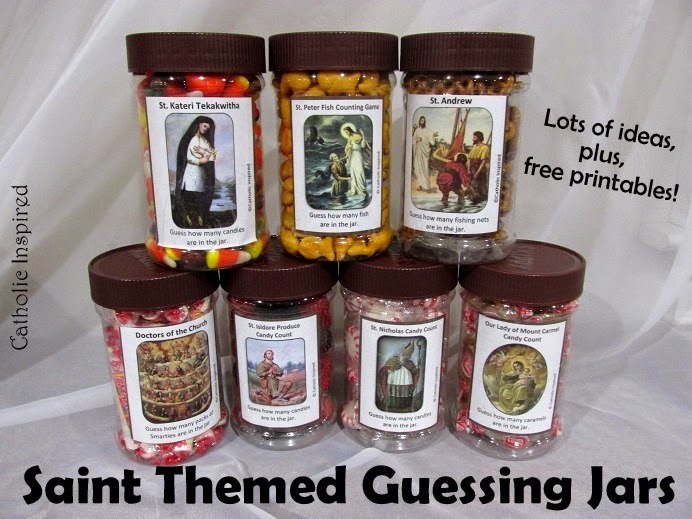 These could be fun for any Catholic event, like youth groups or a CCD/RE class. Check them all out in our ACTIVITIES CENTER! In my opinion, I think this is the tastiest jar listed here! To symbolize our 3 in 1 God, I put 3 musketeers mini bars in this jar. 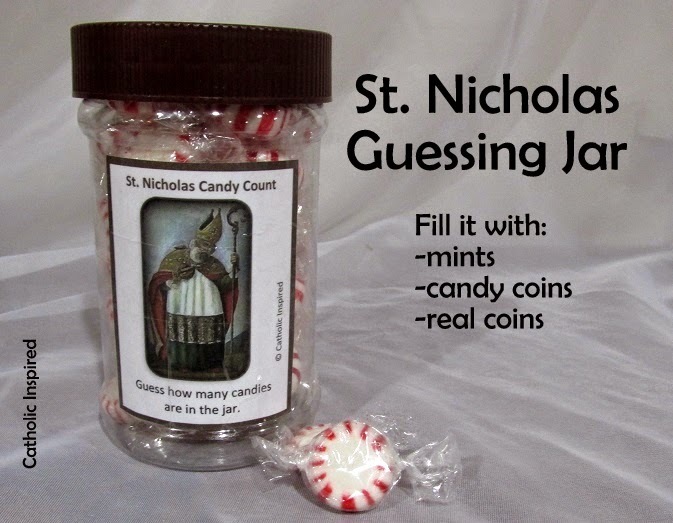 A jar for St. Nicholas could be filled with candy coins, but they can be hard to find so you may prefer to put Christmas mints in the jar. ~OR~ If you are doing this with older kids, teens, or adults you may like to add pennies, nickels, and dimes to the jar and have them guess the dollar amount. Choose the correct label below. This jar would be great for a Christmas party! 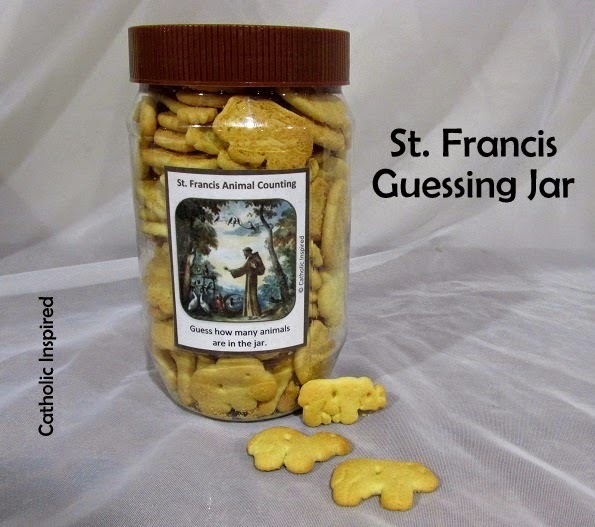 The jar for St. Francis could be filled with animal crackers. 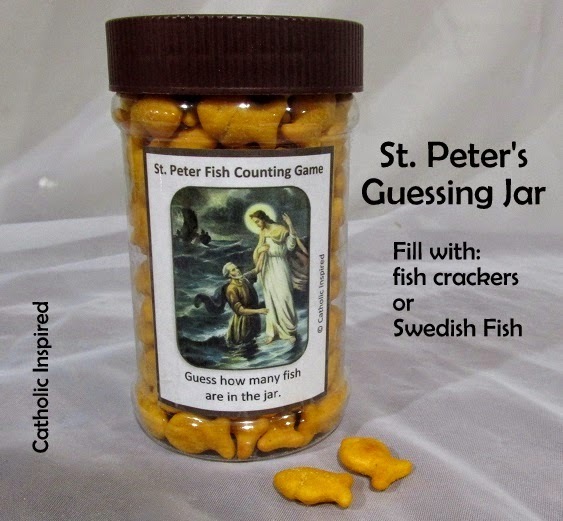 St. Peter's jar could be filled with fish crackers of Swedish fish! 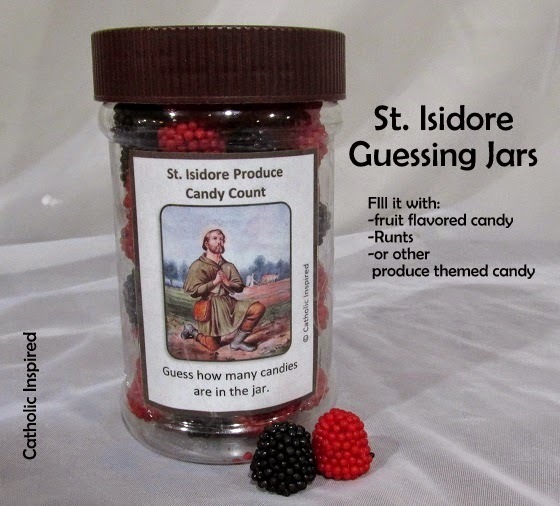 St. Isidore could have a few different candies in his jar. Pumpkin candies, Runts, fruit-flavored candy, or any produce themed candy will work! Personally, I like Runts, but I didn't have any so I used some cute Raspberry gumdrops! Yes, I know that Carmel and caramel are not the same things, but they sound much the same and they tend to wear the same color! ;-) So in this jar, I added caramels. You can use several different varieties of caramel candy: Rolos, caramel creams (like ours), or plain caramel squares. This jar was filled with candy corn and candy pumpkins. 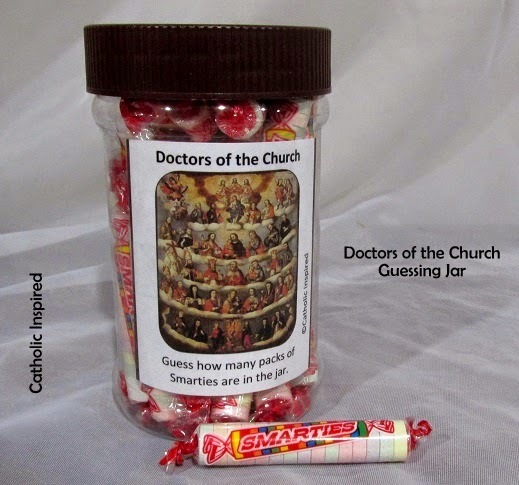 In honor of all the Church Doctors, I filled this jar with Smarties - because the Doctors are known for being so smart about God and the faith! 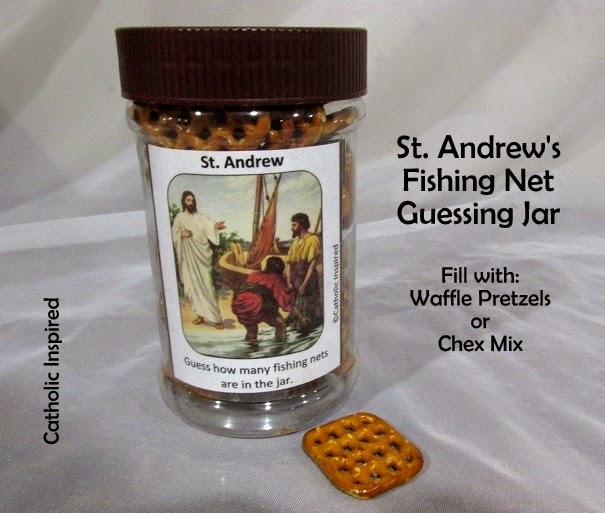 For St. Andrew I added those fun waffle pretzels because they look like fishing nets! You could add Chex mix, too, since Chex can look like fishing nets also! 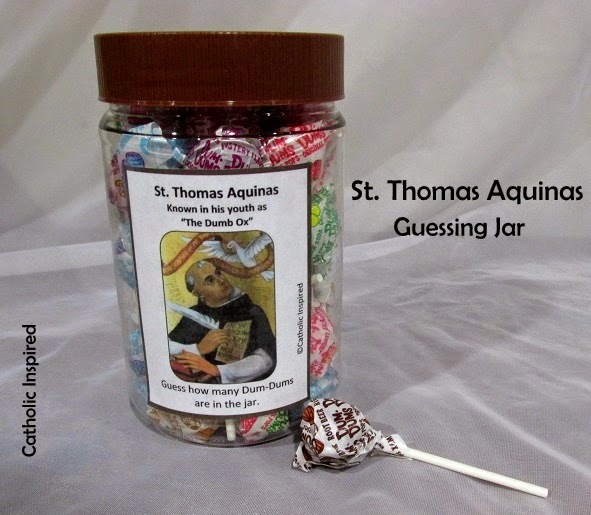 Because St. Thomas Aquinas was called the "dumb ox" in his youth, I added Dum-Dums to this jar. 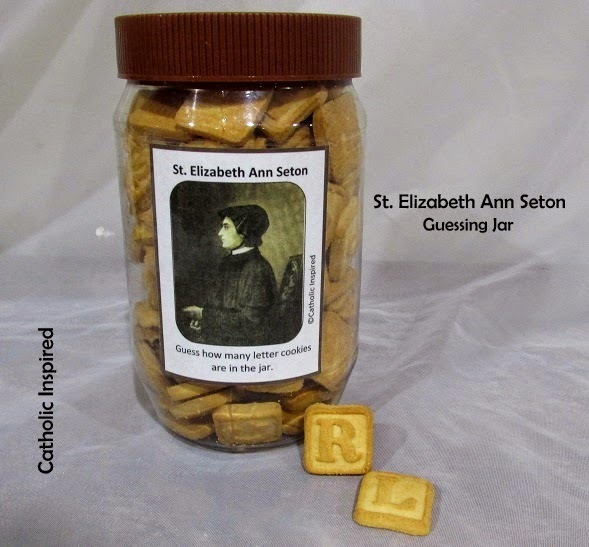 St. Elizabeth Ann Seton started a school for girls in Maryland in the early 1800's so letter cookies seemed to be appropriate for her jar! St. Catherine was condemned to death on the spiked wheel, but, at her touch, the wheel was miraculously destroyed (although later she was martyred by beheading). Those little wheel pretzels seemed appropriate for her jar. The PDF files which include the labels for these jars. are in our ACTIVITIES CENTER! 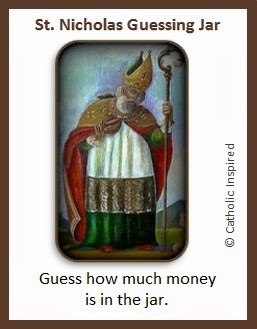 NOTE: The St. Nicholas money guessing label is only available in the image at the top of this post. It is not included in the PDF files. I made one sheet for each of the jars so our guests could write down their name and guess. 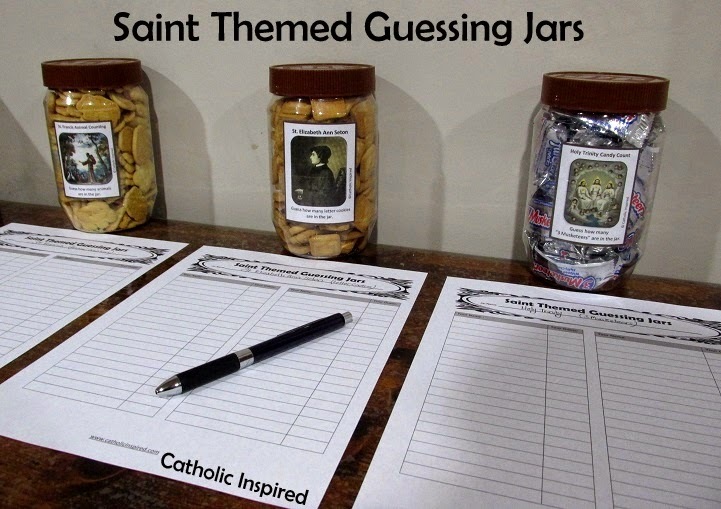 Just write the name of the saint themed jar at the top so you know what jar belongs to that particular page. Anyone want to guess how many candies or crackers are in these jars? Sorry, but if you guess correctly, I'm not mailing the jar to you. I don't even know what to say...maybe, this is SUPER FANTASTIC!! Thank you Hand-Maid, And please don't call yourself inept! We all have different strong points, besides those emoticons can be a bit tricky.... Just type the "code" for the one you want. It will show you the code if you click on the picture. The biggest thing I forget is to put a space before and after the "code". So if you want a smiley it's : - ) - but with out the spaces in between, just a space before and after :-) I'm not sure that helped, but I hope it did. I think the little pics are lots of fun! (3) God bless! This is such a cute idea! Thank you for the awesome labels :).They would be so cute for our parish All Hallows Eve party! I happened to run across the link to this post and just love this idea! I am definitely going to have to put together some sort of variation for our annual All Hallows' Eve/All Saints' Party which we host at our home. Thank you! Thanks for stopping by, Jessica. Hope your party goes well. Our All Saints' Day party was last Sunday at our house. The guessing jars were lots of fun! :-) God Bless! Hi Patsy, I'm glad to meet you! (9) Thanks for all the kind comments you left here on the blog! The artwork you create is beautiful. I'll have to stop by and do a little more looking later. God Bless! Hi Jennifer, your super creative idea came in just in time! I saw it yesterday afternoon, ran to the dollar store for supplies, printed off your tags and had it ready for this morning's class! It was a huge hit! Thank you!! I did end up using gummy worms for St. Peter because the dollar store did not have goldfish crackers and I didn't want to make another stop! Blessings to you! Hi Noreen! I'm happy to hear the kids enjoyed it! (8) I was surprised how hard the fish were to find, too! I looked at our local Dollar Store first, but I didn't find any there ether. Gummy worms are a cute thought! (3) Take care and God bless! I love this idea. 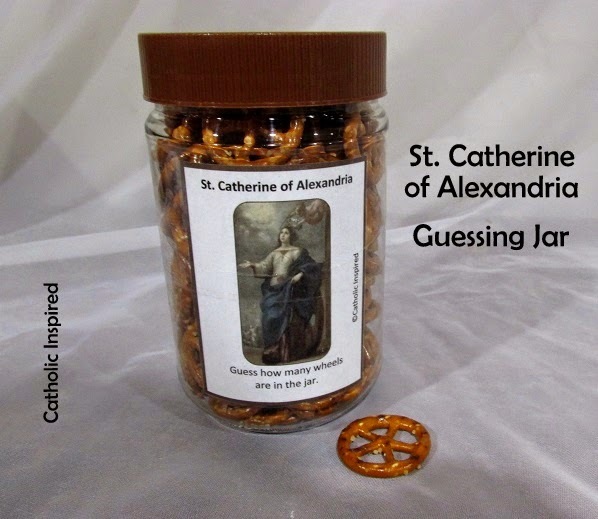 I think it would be a great idea to place jars on a table in the vestibule and have parishioners even guess them a week before All Saints day. Not only would they be glad to win the prize but it would cause them to take a moment to think about the saints and perhaps catechize the parents as well. It might even get the families talking about saints. this is awesome. I am going to use them in my classroom for Math and estimation. LOVE! We made seven of the guessing jars for our All Saints Day party. We received a great response and two party goers guessed the number exactly! They really enjoyed this game and we surprised to hear the winners' guesses. We put the jars in a circle in the middle of a round table so the mason jars would not be handled and it also gave more room for the guests to make their guesses. I also taped down the lids with heavy duty clear packing tape. I put the contents into food grade party bags so I can keep the jars for next year. I'm going to use these for my 5th grade Summer PREP coming up on Monday (6/19/17). Great idea!!! Here's one or two more: St. Domenic - Astronomy (Use STARburst or foil-wrapped stars); St. Sebastian - Athletes (Use the foil-wrapped footballs/baseballs/basketballs or Baby Ruth - for Babe Ruth); I saw that there was also a saint for comedians and you could use Laffy Taffy, JOLLY Rancher, or Fun Dip. Also, for St. Cecelia (Music) - use Symphony Bars. Love this idea! 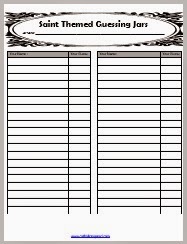 I'm going to use it at our Catholic Schools Week event. Thank you!